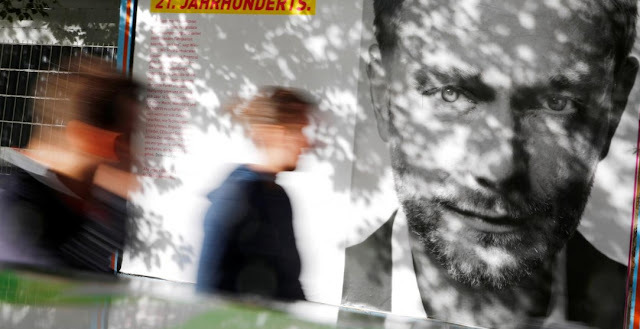 People walk past an election campaign poster for the upcoming general election showing the leader of Germany's Free Democratic Party (FDP) Christian Lindner in Berlin, Germany, September 13, 2017. BERLIN - Later this year, Angela Merkel may form a new government with a party whose leader says Greece should leave the euro, Russia can keep Crimea and refugees will have to go home. The Free Democrats (FDP), a socially liberal, pro-business party, were long seen as the natural partners of Chancellor Merkel’s conservatives. They ruled in coalition with her mentor, former Chancellor Helmut Kohl, for 16 years and were junior partners in Merkel’s second government, from 2009 to 2013. But after crashing out of the German parliament four years ago, the FDP -- also known as the Liberals -- were forced to reinvent themselves. And the new incarnation, led by an ambitious 38-year-old who preaches an ultra-hard line on Europe, has unsettled the German political establishment, including members of Merkel’s party. Nevertheless, if her conservatives can form a government with the FDP after a Sept. 24 election, Merkel will have little choice but to link up with the party and its young leader Christian Lindner. For her center-right CDU/CSU, the prospect of reviving an alliance with the party’s historic partner will be hard to resist, especially after four years of a right-left coalition with their longtime rivals, the Social Democrats (SPD). Polls give Merkel’s CDU/CSU bloc and the FDP a combined score of roughly 45 percent, just shy of a majority. If they do fall short, the FDP could still enter the government as part of an unwieldy three-way coalition that also includes the Greens. In 2013, after its former leader Guido Westerwelle failed to deliver on his promise of tax cuts, the party scored just 4.8 percent, the first time in the post-war era it failed to make the 5 percent threshold needed to enter parliament. Later this month, it is expected to double its score of four years ago. Lindner, with his banker suits and designer stubble, has almost single-handedly hauled the FDP back from the political wilderness. German media have likened him to French President Emmanuel Macron: the two are just a year apart in age and share a healthy self-esteem. In the FDP’s highly personalized campaign posters, a brooding Lindner is shown in black and white, staring off-camera, like a model from a 1990s Calvin Klein ad. Look beneath the surface however, and there are big differences between Lindner and Macron. The French leader is promising to work with the next German government on an overhaul of the euro zone, introducing a budget and finance minister for the currency bloc. Lindner has dismissed those ideas with an aggressiveness that has surprised even some of his closest allies. If one takes Lindner and the FDP’s campaign manifesto at face value, the party would introduce automatic sanctions for countries that violate EU budget rules, do away with the euro zone’s bailout fund and make it easier for countries to leave the currency. Greece is a favorite target. Two weeks ago, Lindner told a banking conference in Frankfurt that a reintroduction of the drachma would be a boon for the country. “All those who vacation in Mallorca would go to the Greek islands instead,” he said. Martin Lueck, an investment strategist at Blackrock, sees a risk that the euro crisis could return, with Italian borrowing costs spiraling higher, if the FDP makes it into government. FDP officials play down such risks, pointing to moderating influences in the party like members of the European parliament Alexander Graf Lambsdorff and Michael Theurer. “Our program is about direction. It shows what we would do if we were able to govern alone, which of course won’t be possible,” one senior official said. But aides to Merkel acknowledge that she would probably be more limited in what she could achieve with Macron if the FDP were a partner, particularly if Lindner became finance minister. “He could make our European partners nostalgic for Wolfgang Schaeuble,” one aide quipped, referring to Merkel’s current finance minister, who is seen as a hardliner himself. If the FDP were to end up in a three-way coalition with the Greens, its more radical ideas would surely be blunted. That is why some members of Merkel’s party say she would prefer a “Jamaica” coalition -- so named because the colors of the parties would match those of the green, yellow and black Jamaican flag -- to a two-way alliance with the FDP. In the final stretch, Lindner has floated an array of controversial ideas in an apparent attempt to lure voters from the hard-right Alternative for Germany (AfD) party. Last month, he recommended accepting Russia’s 2014 annexation of the Crimea region of Ukraine as a “permanent provisional arrangement”. Last week, he said refugees should be forced to go home as soon as peace returned to the Middle East countries from which they fled. Even FDP members say they have trouble discerning how much of this is mere pre-election posturing. As the party’s identity has become intertwined with its leader Lindner, its core beliefs have become muddied. The picture may become clearer on Sunday, when the FDP is due to unveil a l0-point list of policy priorities. Expect a modern twist on classic FDP positions -- tax cuts, investments in broadband and a Canada-style immigration law making it easier to bring in skilled workers -- that are closer to those of other European liberals like Macron. Regardless, the FDP faces a steep learning curve if it makes the leap from outside parliament into government -- a feat no party has achieved since the 1950s. Two-thirds of the FDP candidates who could win Bundestag seats have never worked there before. Only one has cabinet-level experience in Berlin. Later this year, Angela Merkel may form a new government with a party whose leader says Greece should leave the euro, Russia can keep Crimea and refugees will have to go home.